Noodle Bar's claim to fame was as a 'Wok' place. 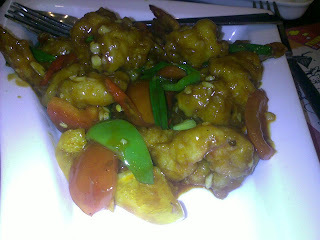 They, along with All Stir Fry and China Joe (now closed), introduced Mumbai to the 'make your own wok' concept. The Noodle Bar branch at Bandra was the original one I think. They have a number of branches now. The one at Phoenix Mills is quite popular given the number of offices around. We went there after a meeting a few days back. A colleague and I decided to take a crack at the a la carte menu instead of the usual wok. We were quite impressed by the food. The chicken momo was very succulent. The steamed flour coating gelled well with the fantastically flavoured minced chicken. The coating was not clammy and sticky at all. It was so tasty that I was willing to overlook the fact that it was healthy. 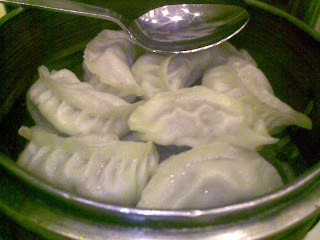 The momo brought back fond memories of the Tibetan Momo places in the nooks and crannies of Bhowanipore in Calcutta for me and my fellow Bong partner in food crime. I was happily surprised by the quality of the mixed fried rice. The rice was firm and well textured. A bit of help from the soy and chopped chilly in vinegar dips and it was on its way to passing my very high standards in fried rice. We had something called 'drunken prawns' to go with it. Huge, fresh prawns made in a delectable sauce of honey and red wine. The balance of the flirtatious wine and the sweet and homely honey were just right. Neither out shouted the other. Very harmonious. Apt bridesmaids for the glowing prawns. The price, Rs 485 (10 USD), was the only jarring note. The food was on the expensive side as the other dishes were upwards of Rs 300 (6 USD) each. More expensive than restaurants of its league. Possibly cashing in on the corporate crowd. Though expense accounts are supposed to have become extinct after the slowdown. The third member of our group had the buffet (Rs 350/ 7 USD) which had mom, spring rolls and nine billion starters, main courses and desserts. The binge eater's fantasy. The service was prompt. The menu was self explanatory and I didn't subject the stewards to any questions. Definitely a place to considered if you want Chinese and are marooned in Lower Parel. 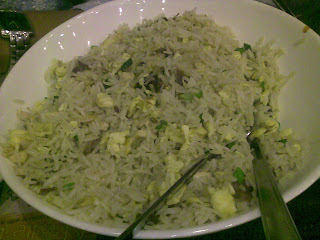 And since you are a Candies fan, I am sure you must have had the dragon chicken and chicken fried rice..I used to love that combo a lot! I can't have rice which is sticky and not separate. Specially in steamed rice and biriyani. reminds me of all the delicious momos we would have in the "Tibetian Delights" in Kolkata and also the homemade ones in Darjeeling.. I feel like going back in time. The first time I heard of Momos Soma was when I went to Darj in 4th standard. My mom had it.